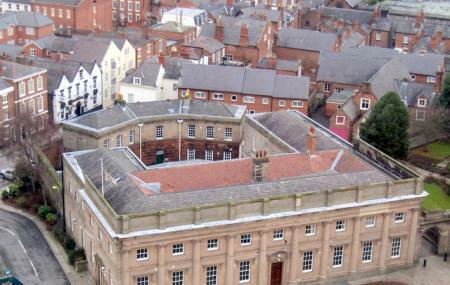 Cheshire Military Museum is a military museum in the city of Chester and it covers the history of four British army regiments. The building has gained popularity among tourists due to its beautiful architecture and the artefacts of British history that it carries itself. So take some time out and experience the real Bristol in this Military museum. The building is recorded in the National Heritage list for England and has a Grade I Listing. The price mentioned is for adults. Concession tickets are for 2 British dollars. Family tickets are for 9 British dollars. Buses can be taken from o/s Ye Olde Kings Head station. How popular is Cheshire Military Museum? People normally club together River Dee and Roman Gardens while planning their visit to Cheshire Military Museum. Interesting museum if you're keen about military history. Very factual and interesting displays in there. I also thought it was a very nice touch to add a modern military section in there too! Short but good visit, small place but lots of history great for kids quite a bit of interactive items. shame about the outdoors expected a few other military vehicles but overall a good place to spend between 1.5 - 2 hours.